We all know the super properties of the incredible fruit, Avocado and its highly tasty & versatile properties. Now it’s time to showcase more of it’s super yumminess. We’ve seen the stuffed avocado everywhere but now here’s the simplest of simple versions that’s guaranteed to please herbivores and carnivores alike! Ready to be the hostest with the avocado mostest? Then Lets Do The DIY Thang! 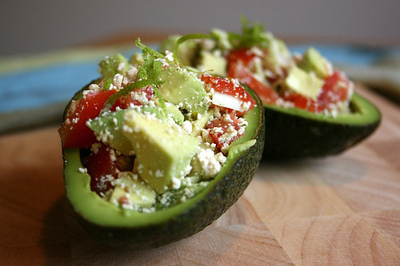 Grab some ripe avocados, a few small tomatoes (diced), crumbled feta cheese, a lemon (for a squeeze or two of juice) and some salt and pepper (freshly ground, if possible). Next halve the avocados you wish to use as your ‘bowl’ lengthwise and cube the other, not forgetting to remove the pit. Top each half with tomato, feta and bits of cubed avocado. Drizzle with lemon juice and garnish with dashes salt and pepper and serve. It’s THAT SIMPLE and THRICE as delicious! Wanna mix it up a bit but still keep it herbivore friendly? Add some diced yellow bell peppers for color or maybe some quinoa for protein. No matter what you choose, it’s hard to mess up what could quite possibly be the world’s most perfect fruit! Ooh! The possibilities are endless! This looks scrumptious!! I will be doing this tonight!